Mysteriously, a baby princess and a piglet have switched places! For the first time, it actually happened without the assistance of a bad fairy. Unless you call Jonathan Emmettor a bad fairy. He is the author of The Princess and the Pig who started the whole flip-flop in the first place! And Poly Bernatene, the illustrator, may not be totally innocent himself! 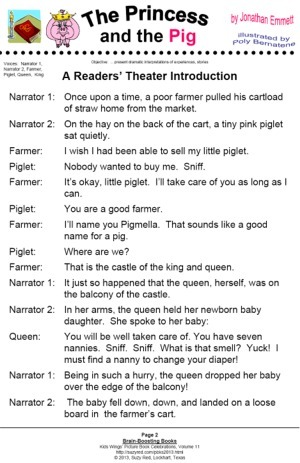 What "princess" skills would a piglet find hard to master? 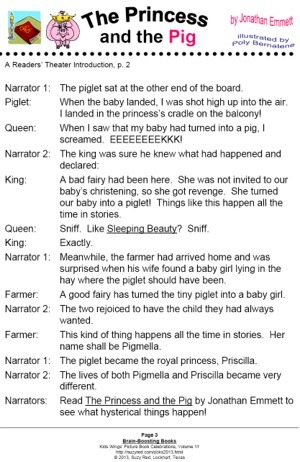 Would a king and queen have trouble passing a piglet off as a princess? Would anyone believe that a farmer's daughter is actually a real princess? What would a piglet do with books in the royal library? Could the nannies make a piglet look like a princess? What would a piglet do at a birthday party? The Kids Wings staff is still LOL ROFL (laughing oink loud, rolling oink the floor laughing) at the antics that unfold! Jonathan Emmett brings you an unforgettable, hysterical picture book your students will beg to read again and again. Then, if pigs really do turn over your giggle box, you'll also need the companion books, Princess Pigtoria and the Pea, and The Great Pig Search! 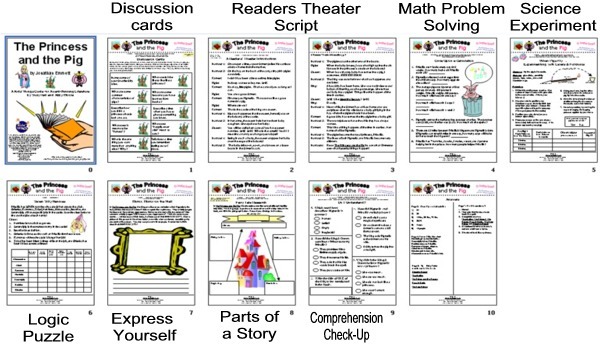 AND then, when your principal or homeschool neighbors poke their heads into your classroom to see if you've forgotten that your kids should be actually LEARNING instead of having so much FUN, the 32 pages of activities in the Kids Wings literature guide will assure them that, indeed, learning can be fun. Invite your guests to sit down and join the fun for the day! John Branyan - The Three Little Pigs in Classic English. Jonathan Emmett is part of the 2013 Literature Collection, Brain Boosting Books! Buy The Princess and the Pig NOW!